It’s refreshing to see a company like Shure – with more than 80 years of building microphones — still offering USA-manufactured products. Sure they have an ever-increasing line of Chinese-made component products (headphones, entry level mics, etc. ), but I believe there are still loyal customers out there who will pay for U.S. manufacturing no matter how inexpensive the Chinese microphones get. With that background in mind, enter the USA-manufactured, latest large format condenser products from Shure, the KSM42 and KSM44A. These mics are ideally suited for the home recording studio — from state-of-the-art pro to the talented amateur who wants a better sound. The KSM42 ($999 MSRP; $799 street) and KSM44A ($1,249 MSRP; $999 street) are both full-sized condenser microphones designed for studio and live applications. Both are meticulously crafted from premium components. The KSM44A is Shure’s new and improved multi-pattern large-dual-diaphragm condenser, intended to fall somewhere between high-buck German offerings and Chinese “me-too” products. Both The KSM44A and KSM42 are manufactured in the U.S.A (Wheeling, IL). The Shure KSM42 is a large, dual-diaphragm, side-address, cardioid condenser microphone designed for live and studio vocal performance. The mic features dual-diaphragms with an active front, ultra thin (2.5 micron) 24-karat gold, low mass, 1-inch Mylar design. In my opinion, the KSM44A is the real winner. At $999 (street price), you get a lot of bang for your buck with this microphone. 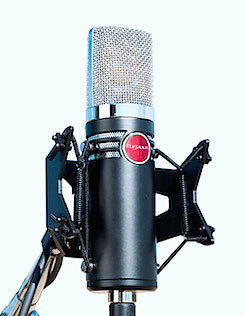 With three polar patterns to choose from (cardioid, omni, figure-8), this mic becomes a Swiss Army knife in the studio. The Shure KSM42 is recommended for “world-class recording” and performance applications — including solo and backing vocals, voice-overs, speech, acoustic instruments, and wind instruments. **Included KSM42 accessories include a locking aluminum carrying case, open-cage ShureLock® shock mount, Popper Stopper™ magnetic pop filter, and protective velveteen pouch. The Shure KSM44A is a multi-pattern, large-dual-diaphragm, side-address condenser microphone with multiple polar pattern options (cardioid, omni, figure-8). 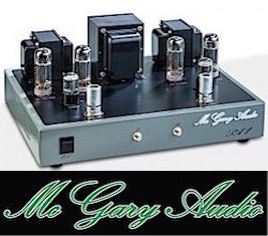 The KSM44A features externally biased, dual 1-inch diaphragms, extensive internal pop filtering, and transformerless Class-A Prethos™ Advanced Preamplifier Technology. The Prethos™ technology provides a meager 4 dB of self-noise and maximum SPL of 131 dB (without the pad engaged) for 127 dB dynamic range, an increase of 7 dB over its predecessor, the KSM44. That, according to Shure, “sets the standard for cleanly nuanced audio capture” — especially for 24-bit recording. 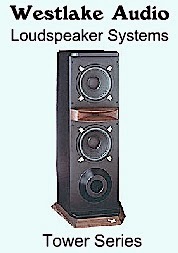 Its 24-karat, gold-layered dual diaphragms are ultra-thin (2.5 micron) and have been designed to offer outstanding real frequency response from 20 Hz to 20 kHz. A multi-position low-cut filter and 15 dB attenuation switches provide added flexibility. The low-cut filter provides the option of flat, -6 dB/octave below 115 Hz, or -18 dB/octave below 80 Hz. The signal-to-noise ratio varies with chosen polar pattern, but is a respectable 90 dB (cardioid), 88 dB (omni), and 86.5 dB (figure-8). The KSM44A features gold-plated connectors inside and out. 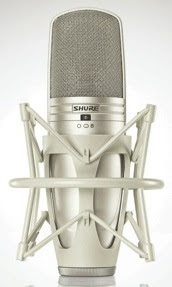 The Shure KSM44A is designed to provide high-end performance in applications such as: vocal performance, voice-over, broadcasting, acoustic instruments, wind instruments, low-frequency instruments like double bass, kick drum, electric bass, overhead miking of drums, choral or orchestral ensembles, and room sound. Accessories include a locking aluminum carrying case, ShureLock® shock mount, ShureLock® stand mount, and protective velveteen pouch. The Shure KSM42 and KSM44A have an austere look, perfect for any mic cabinet, professional studio or stage. The ShureLock® shock mount and stand mount are both well designed and work smoothly. Shure’s Popper Stopper™ magnetic pop filter is easy to attach and remove. 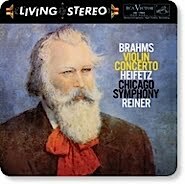 I started my test with the Shure KSM44A. I couldn’t wait to give this mic a shot. With so many potential applications, my interest was piqued. The mic fit nicely to my stand via the unique ShureLock® stand mount. Following the KSM44A I moved to the KSM42. 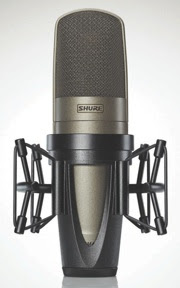 The audition — KSM44A **The Shure KSM44A spec sheet lists solo voice, voice-over, and broadcasting as some of the microphone’s recommended applications. Thus, after attaching the magnetic pop filter accessory that came with the KSM42, setting the low-frequency filter switch to flat response, and the attenuation to 0 dB, I began testing the microphone with my voic. The first thing I noticed was that the microphone’s self-noise was extremely low yet it had incredibly high output. 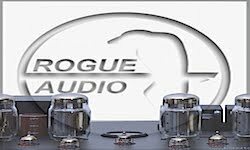 My voice sounded clean and crisp, less “cottony” than other high-end microphones I have used for voice-over applications. There was a nice boost to the mid-range that helped bring out hard vowel sounds. P-popping – at least at this SPL – was non-existent. Likewise, breath noise was minimal in between words, perhaps due to the mic’s three-stage mesh grille. There was no significant drop-off in low-frequency response as I moved from 6-8 inches and 20-24 inches from the microphone’s grill. With these qualities, the Shure KSM44A could be a real problem solver in broadcast applications – not to mention physically erratic vocalists in the studio. I proceeded to the 1969 Martin D-18. This guitar has the warm and woody sound of a 42 year old Martin. Its long sustain and mid-range crispness make it a good guitar to track — whether flatpicking, strumming, or fingerpicking. I retained the same microphone settings I used on voice (flat frequency response and 0 dB attenuation) and positioned the microphone between the 12th fret and sound hole. I played a typical bluegrass flatpick run and was amazed at how transparent and uncolored the low-mids of the guitar recorded. Similarly, the 7th, 9th, and 12th position fretwork came out articulate, crisp, and uncolored. In other words, my guitar sounded just like my guitar. Good deal! **For my last test I positioned the mic just off the speaker grille of the Mojotone ’57 Twin kit amp in front of one of the two Electro-Voice EVM-12L loudspeakers. I once again chose the cardioid polar pattern – and given the 134 dB maximum SPL setting with the pad disengaged, kept the same settings as the previous test. With the volume of the amp set low and EQ centered, the natural brightness and jangle of the Gretsch recorded nicely. Again, no noticeable “color” from the mic. As I turned up the amp volume I noticed that the mic translated the lower-mids and lower frequencies very accurately – almost too accurately. Taking a moment to re-adjust, I engaged the -15 dB pad and switched the filter switch to roll off everything below 115Hz at 6 dB/octave. This definitely did the trick as I got more of the mid-range I was looking for from the amp and the guitar, less of the muddy bottom. Again, this mic gave me the sound of the guitar and the amp, no unwanted microphone color. The KSM42 does feature a highly consistent polar pattern and good off-axis response and would make a good entrance into a mid-level large-dual-diaphragm-condenser for someone only looking for a voice-over or vocal mic. I should mention that Shure has significantly reduced proximity effect problems through the use of two diaphragms – one passive and one active – in the KSM42. This means that a vocalist can move about back and forth from the mic without any significant change in bass response. This is great for working with non-professional singers and speakers. Because of its price, I could see the KSM42 doing well in home-recording studios looking to step-up from the low-cost Chinese mics. However, for a mere $200 more, you could add the versatility of added frequency response, attenuation, and three polar patterns provided in the KSM44A. If you don’t have the bucks, the KSM42 is good. If you do, the KSM44A is worth the upgrade – especially if you are a recording multi-tasker. The KSM42 and KSM44A are two high-quality, problem-solving microphones; the latter offers performance that rivals the fabled German mics, while The KSM42 is a nice sounding, uncolored, go-to microphone for vocal and speech performance. The KSM42's feature-set is outstanding: fixed cardioid pattern, tailored low-frequency roll-off to make the engineers’ lives easier, integrated three-stage mesh grille to mitigate wind and breath noise, low self noise, premium gold components, rubber suspension shock mount, and magnetic pop filter. If you’re looking for the right tool for the job – and that job is vocals or speech, this is your mic. In my opinion, the KSM44A is the real winner. At $999 (street price), you get a lot of bang for your buck with this microphone. With three polar patterns to choose from (cardioid, omni, figure-8), this mic becomes a Swiss Army knife in the studio. Add a real flat frequency response of 20 Hz to 20 kHz and the possibilities are without limit: bass, Leslie speaker, piano, horns, kick drum, you name it. 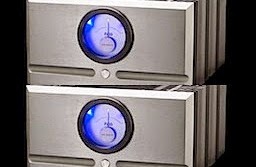 I would love to demo a pair of these for use in ambient room recording and drum overheads. All in all, the KSM42 and KSM44A are affordable (in the context of high-end microphones) and sound great. They are indeed worthy additions to the Shure KSM product family. And the KSM44A gets the Everything Audio Network Stellar Sound Award.